Thank you so much for the reservation on this occasion. Notes; ※Please make sure to check the following. Check-in is from 4pm to 9pm. Check-out is from 7am to 10am. Please tell me the check-in time when you have decided upon the plan. Final check-in acceptance is at 9 in the evening. You can use the Demand bus from the nearest station. Please be careful, there aren't many buses on the weekends and national holidays. To everyone of guests, please show me your ID or passport when you check-in. If you do not have it, you can't be staying here so, please make sure you bring your ID or passport. Please bring amenities, such as toothbrush, towels, pajamas,,, etc. There are soap, shampoo, and rinse in the bath. Keep an eye on your valuables please. In case of the loss, I am not responsible for any trouble that may occur. We do not allow to eat or drink in the guest rooms. Please eat or drink in the 1F. No smoking in this guest house. Please use the smoking area. It's in entrance before provisions. If you have old car navigation systems, you can't search this hostel by phone numbers. Search it by street address. If your car navigation system is map code model, search by map code. 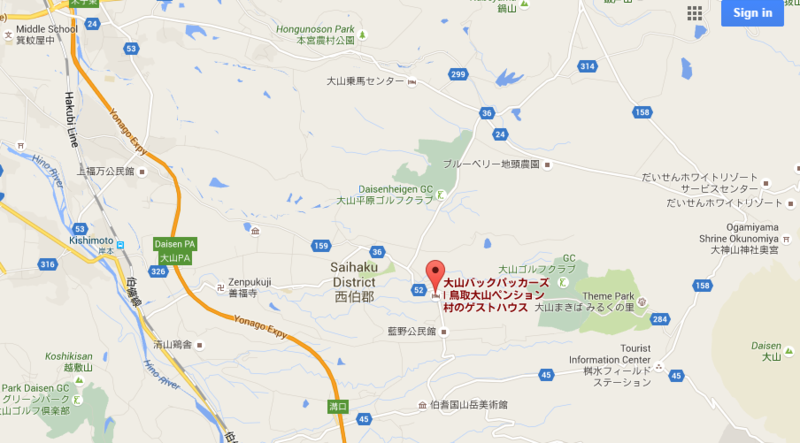 ↑Please click this map and go to google map! You need an automobile tire for driving on snowy roads in winter season. There's parking area in the hostel. There are many police trap around the pension village. So don't forget to fasten your seat belt, and you have to stop when you see the sign. Police officers are watching out for speeding cars. General transportation, the nearest station is JR. Hakubi-sen Kishimoto. Transfer from San-in Honsen in Hoki-Daisen station to Hakubi-sen. The next station is Kishimoto. Transfer from San-in Honsen in Yonago station to Hakubi-sen. The third station is Kishimoto. From Kishimoto, you can ride Demand bus. These buses are Demand buses. boarding time is about 15 minutes. Please note that the weekend of the bus is few. The nearest bus stop is ”Pension village”. But maybe bus driver can't understand English. Please show to him these sentences. They are guest for Daisen Backpackers. Please guide to ”Pension village”. ①Bus driver drop you off at Pension village Entrance. ③You can see Daisen Backpackers signboard right side. There is bus stop at Pension village Entrance. If you want to go to Mt.Daisen from Daisen Backpackers. Please take on "Daisen Loop Bus" . After climb up Mt.Daisen,you can go to JR Yonago station. Please take on shuttle bus. Daisen Loop bus is suspended! Service resumed, July 23th (Saturday). Summer vacation period (July 23th to August 21th), and daily service. Daisen Loop Bus is the sightseeing bus route where you go around main tourist attraction in Mt.Daisen area. It's moving focusing on the weekend and holiday on April 29th-November 6th. Our place is not convenient. The restaurants which can be shown around here are some restaurant.